Today we are going to show a beautiful, original, modern and perfect decoration for those who love flowers arrangements. 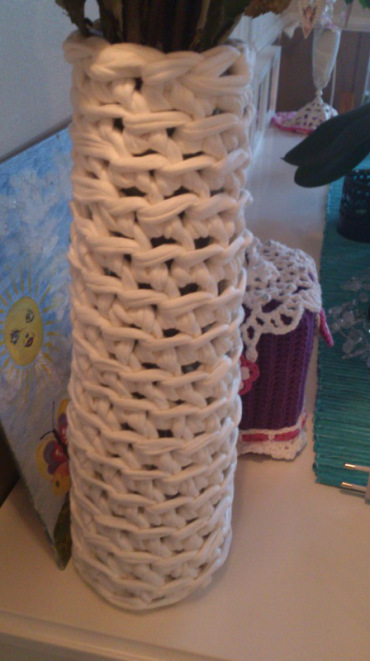 Let’s make knitted vases with fabric to give warmth to your house or decorate recicled bottles to keep your flowers. It seems an ideal project for cold weather, and it truly is, in addition to achieving a delicate, beautiful and ecological utility for your home. 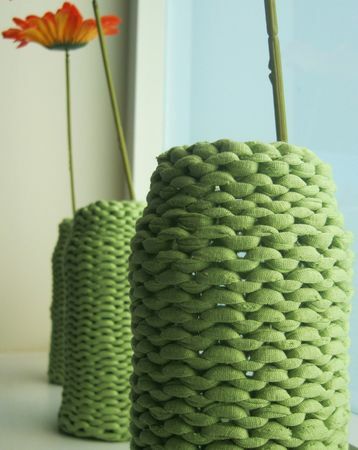 If you look up close, the fabric of these crochet vases is impeccable, looks beautiful and is a really admirable work. You can see these vases in lamone’s blog. Using other stitches and differents colors of fabrics you can achieve other types of vases, beautiful and warm, ideal for a delicate and special decoration. You can see these and other t-shirt yarn vases in hekledilla. 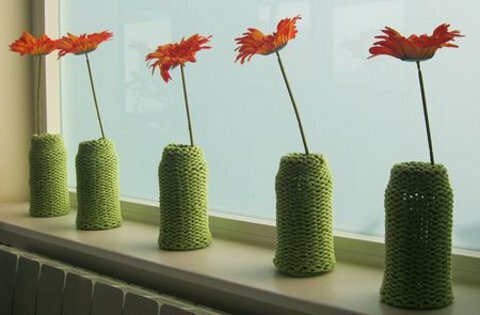 How to make t-shirt yarn vases? In this tutorial you can learn how to make linings for vases, glasses or candle holders with a woven cover that is very beautiful. The step-by-step tutorial is in Spanish. See the tutorial to make a vase in wonderful hands. 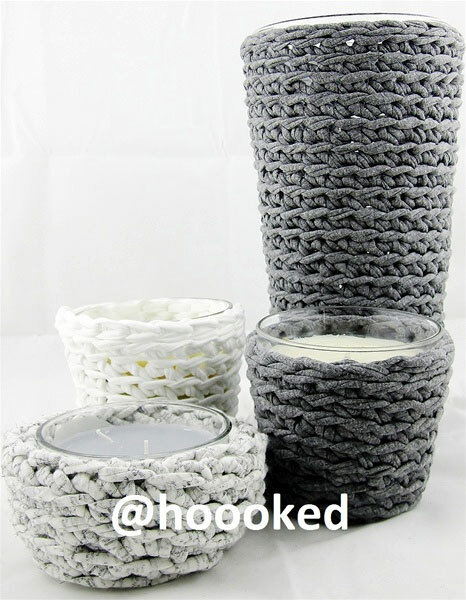 This season you we can give warmth to your house with woven vases, candle holders and blankets for jars with this excellent idea to use t-shirt yarn in decoration. 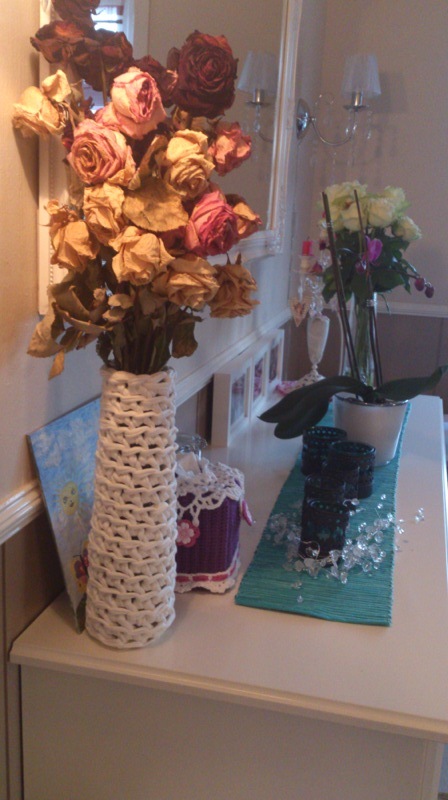 This entry was posted in Crafts and tagged crafts, crochet, fabric vase, How to make knitted vases, knitted vase, t-shirt yarn, vase on March 5, 2019 by Sue.